Things have been quite busy this week at DIYbyDesign. I am hosting a Cutting Edge Stencil giveaway. Don't forget to enter for your chance to win. As a copycat project, I made a crochet hanger Mine is not nearly as perfect as my Grandmother's, but I'm happy with it for my first attempt. You can also check out my tutorial on how to transfer a graphic onto fabric. I also shared with you the story of a miracle that happened to our family this weekend. I want to thank all of you who have commented and emailed me for your support. Sara will be coming home tomorrow night!!! Seaside Interiors showed off her beautiful fall decor. This is only one of many vignettes she shares. All of her decor is gorgeous. 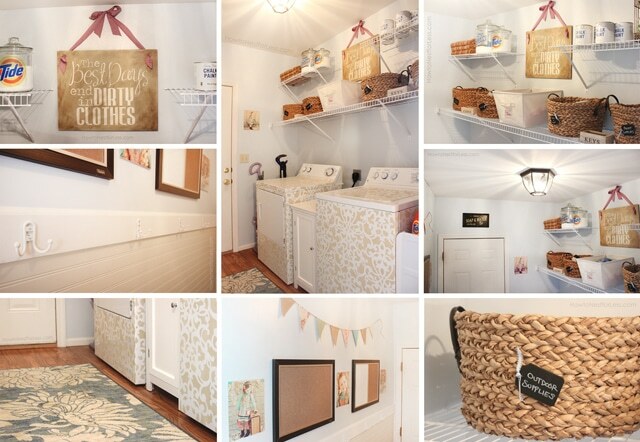 How to Nest For Less shared her laundry room makeover. I just love the stenciled washer and dryer. A Girl and a Brush transformed this dresser. I love the paint color...it's called Amsterdam Blue. It's the perfect blue-grey color. Great job. Polyanna Reinvents transformed an old piano bench into this beauty. This knitted newborn pea pod and hat made by The Creative Imperative is just too cute. Under the Suburban Sun shares a tutorial on how to make this beautiful autumn wreath. Homey Home Design shared her recipe for pumpkin layer cake. What a perfect cake for fall. Delightful Deeds shared her recipe for fruit trifle. It looks so yummy. Thank you for hosting Judy! Thanks so much for hosting Judy! Thanks for sharing peeks at your latest posts. Lovely features too. Thank you for hosting. Judy, thanks for hosting! Your stencil and your basket are wonderful! What great features, Judy! Thanks so much for hosting...so happy to hear that your cat will be home tomorrow! Wonderful features, thanks so much for hosting! Thanks so much for hosting this fun fall party. Thanks also for inviting me! I appreciate your sweet comments you left me. Have a great week! Hi Judy! So glad to be here this week! Thank you so much for hosting. Such great features! 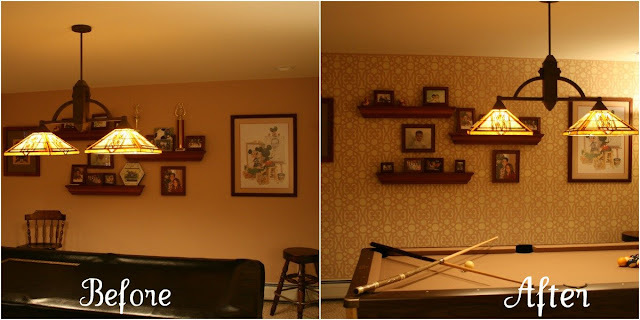 That Erin's laundry room and stenciled washer and dryer...oh my! Thank you so much for the invite! Love the blog! Hi Judy! Thanks for hosting the link party. Hope you have a great week! What wonderful inspiration from so many talented people! Glad I could join your party today, Judy. Such great looking features, Judy! Thanks for hosting! Judy, thank you for the lovely invitation! You have a great party going on, I am happy to join! Thank you so much for hosting. This will be my last link up for a while as I am going on Maternity Leave. Thank you so much for letting me share with your readers each week! Thank you for the party! Love the transformations featured. Especially that pool table!! So Pretty.